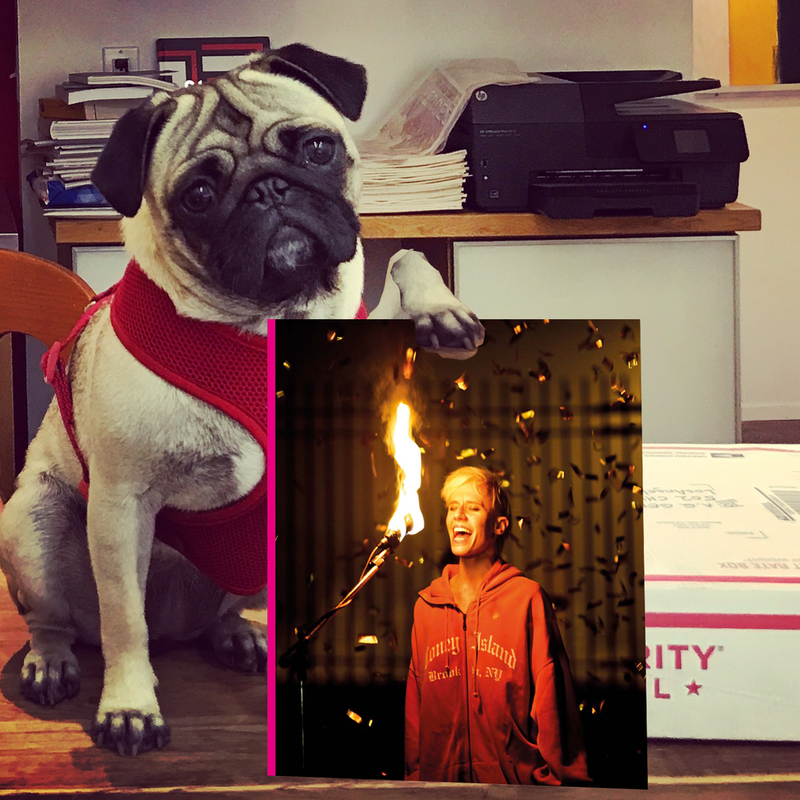 Marlowe the Shop Dog exhibits an uncanny knowledge of our collection and is a fantastic source for identifying great gift ideas. She loves her online fan base as well as everyone who shops digitally but she especially likes it when you drop by IRL. Its hot. Its August. Please no jokes about the “Dog Days”. Accordingly the streets are empty and the guy at the end of the leash has me working the ol’ Social M to get you guys to shop online instead of braving the heat to visit IRL. I picked Ghost Town as an appropriate title for today. Wurth has long been fascinated with the mystical vistas of the American west and the isolation and freedom of vast desert expanses. Ghost Town narrates the tale of 3 women as they journey through Nevada where they soon find themselves stranded with a broken down car, on the side of a desolate road. I feel the heat off the pavement, understand their dread. In an ode to Dora’s anti-commercial streak, we refused to sell this book to anyone unable to identify Dora as “Da Cat”. Now we think everyone could use this book as a perfect summer antidote of authenticity in this time of toxic, “post truth” leadership. The surfing icon who became an icon, Dora was the epitome of 60’s California beach culture. Talented, earning trophies he disdained, Dora became the legend, “Da Cat”. Fed up with the commercialization of a lifestyle he helped define, he turned his back on Malibu to wander the world. This book is filled with tales and photos from the hedonist milieu at the heart of the post-Gidget surf boom. Later, some graffiti appeared on the wall at Malibu Point during his time away on the road. 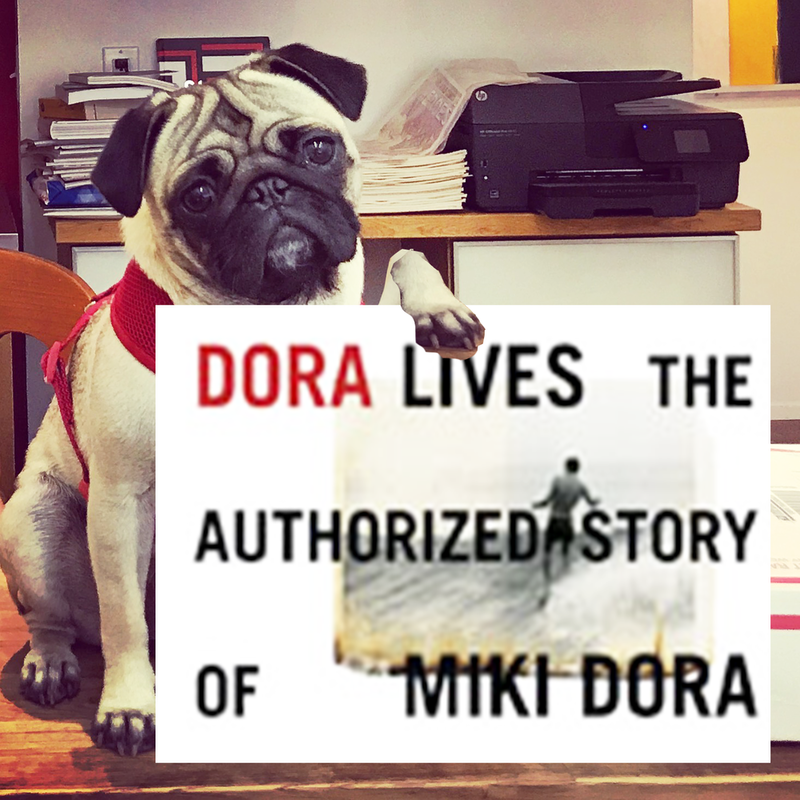 It sums up his role in the surfer’s imagination and still holds true: “Dora Lives”. California born and now Berlin based Owen Gump's (b. 1980) stark B&W photos portray the American West not as a pristine, untouched nature but more like the result of relentless human interventions - not usually for good. More powerful and inspiring for action than depressing, Gump delivers a hurricane force wind of truth. Nauman's famous spiral of neon letters spelling out " the true artist helps the world by revealing mystic truths" at once summarized and opened to critique the perennial mystique of the artist. It might well apply to those who voluntarily sent themselves into harm's way for god and/ or country; the battlefield as canvas. Nauman's work is an indispensable part of recent American art's narrative. this volume, published in DuMont's fantastic "Collector's Choice" series treats this and Nauman's other recurring themes of his oeuvre such as sound, language, corporeality and dance. HOOORAHHH! From 1968-69 Bob made works with mirrors and organic material that he called "mirror displacements". Seminal to his highly influential site/nonsite projects, this is a hard to find catalog from his posthumous show at the John Weber Gallery NY in 1987. A great resource for scholars and a must have for the Smithson aficionados. Jump on it at aggeiger.com before someone else snaps it up! RIP, Ed. The crustiest of the Ferus Gallery's "Cool School" of 1957, Ed emphasized gesture and mark making on both the canvas and in his life. This is his first major monograph and a great way to remember a great one. With a forward by art historian Frances Colpitt @francescolpitt and text by @barbarahaskell. I thought I'd pick Rashid Johnson today because he is awesome and has a dog but also because this book documents the creation of an ecosystem where fact and fiction, history and mythology converge. What could be more contemporary when our time has been bent: cities where there is no running water but there is Facebook and we have been suddenly thrust into era dominated by a Nixonian non sequitor in a world well changed from the myth of the "great America" some want to become again. As you know, we specialize in contemporary California artists but we are also fond of certain German painters like Gerhard Richter or Sigmar Polke. 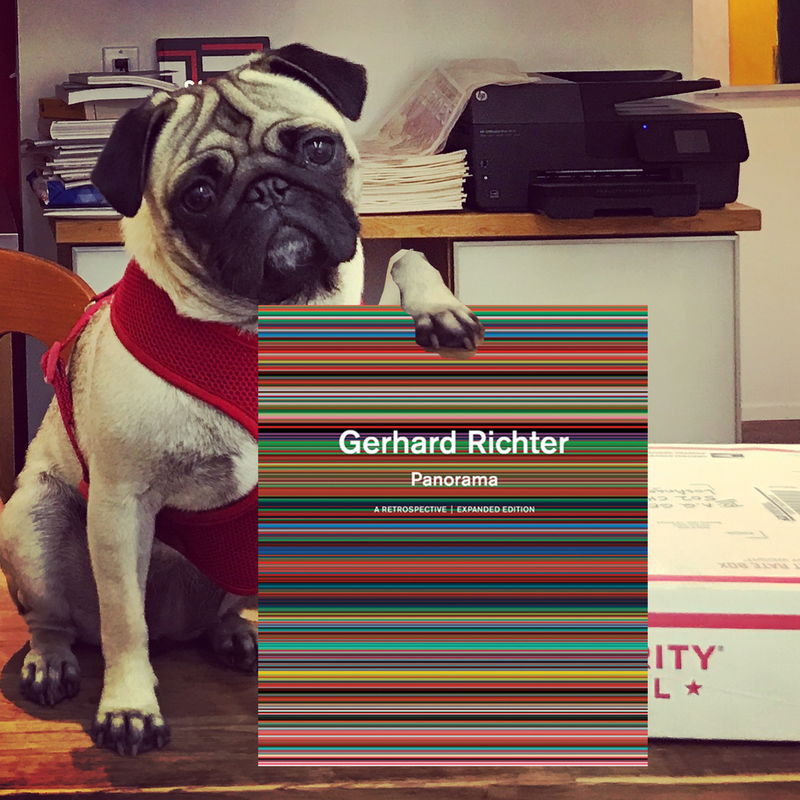 The guy at the end of the leash scored this tough to find "Panorama" expanded edition of the Richter retro at the Tate in 2011. A super volume of work by this painter's painter, this is a very cool book. Besides, I've had it with you sheeple and your embracing of an authoritarian idiot so I picked a post war master that watched his country emerge quite literally from the ashes of madness. I also have a crush on the German Shepherd next door and hope he is reading this. Wally Berman, inspiration to all contemporary letterpress people, remains one of the underappreciated or best kept secrets of the California post war era. A crucial figure in the underground culture of the time, Berman was a catalyst that effected many different worlds; transferring ideas and dreams from one circle to the next. 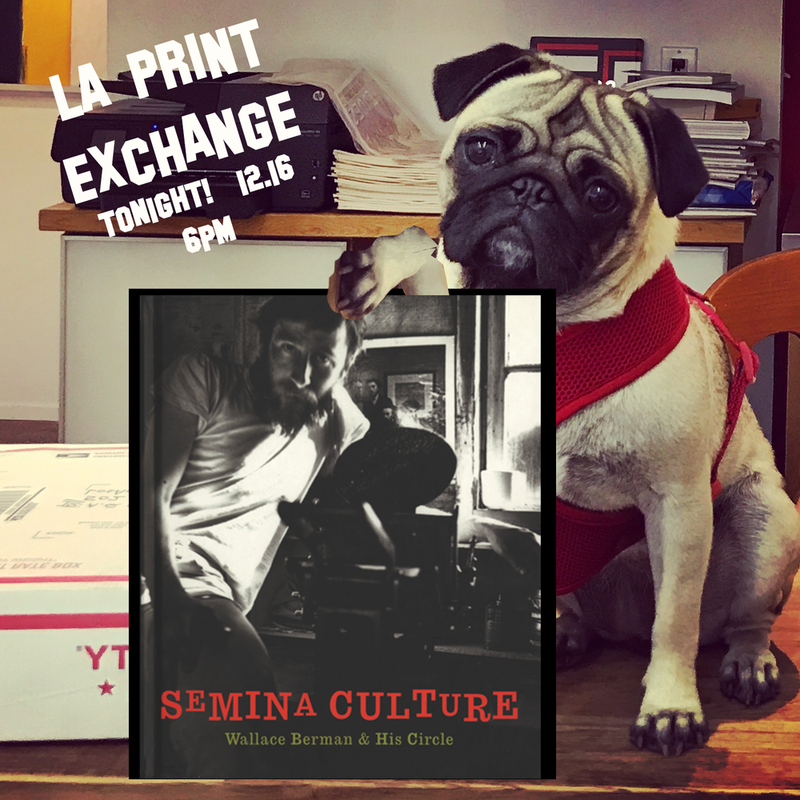 Such is the spirit of TONIGHT'S 2nd ANNUAL LA PRINT EXCHANGE in which artists trade their work and talk shop. Bring your dog! As you humans race in and out of malls and burn up the internet with last minute holiday shoppin, I chose Jeff Koons' "Now" as a fitting pick for today. This fully illustrated catalog was published on the occasion of Koon's show at Damian Hirst's Newport Street gallery. "Now" spans the duration of Koon's career in which he continues to investigate mass culture, commerce, advertising, taste, pleasure and banality. It also begs the question on whether Hirst and Koons are just luxury brands peddling their wares from trendy storefronts. Sounds like holiday shopping to me! BTW, I'm a year old now and have outgrown my doggy bed (HINT!). With the #Metoo rise up it looks like you humans are finally going to wake up and do something about that guy with the funny fur on his head. Who does his grooming? Honestly? "MOTUS, Hello Stranger" is a volume from Damiani that documents the world famous theater group whose hybrid work has unhinged dramaturgy since the 90's. I find this particular image appropriate for the times.